The Reddit event that brought invasions back. Lordran, the dusky, desolate world of the original Dark Souls, is a famously punitive place. The gruelling atmosphere extends to the game’s optional multiplayer, which enables other players to ‘invade’ your game and ambush you for your hard-earned resources. Now, just over six years after the game’s debut, franchise fans turn to the community to give both returning veterans and fresh blood the same sense of unease and competition that they experienced back at launch. Return to the Nexus was an event that came about in 2013, when YouTuber Peeve Peeverson put out a call for players to dust off their PS3s and pop in Demon’s Souls, the predecessor to Dark Souls. Many of the collectibles in Demon’s Souls are locked behind a cryptic system where the playerbase’s behaviour can affect things like enemy difficulty or even prompt special events. It lent the game to a community-driven revival event. For many fans of Hidetaka Miyazaki’s work, the multiplayer components of Dark Souls make an indelible contribution to the tone and themes of the game. This led to the moderator “practically begging” Facebook page administrators and other gatekeepers of the community to give it a chance. This year, they hosted the kickoff stream for the event—a process that they describe as “difficult”. Streaming anxiety, carving out prep time and reaching out to content creators are just some of the challenges. It’s easy to see how this sort of event could foment stress—there’s a reason that community management is a paid position at many companies. Still, speaking with participants, the effort is definitely appreciated. That’s because for many fans of Hidetaka Miyazaki’s work, the multiplayer components of Dark Souls make an indelible contribution to the tone and themes of the game, and the lack of activity in the community robs any new players of that experience. Return to Lordran offers a way for them to restore an essential part of the ‘launch’ Dark Souls experience. 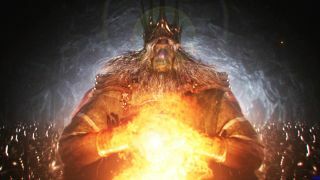 While you can play offline and opt out of these encounters, Miyazaki designed several areas of the game as invasion hotspots, building multiplayer covenants and rewards to encourage such behaviour. Your actions towards NPCs can label you a sinner, marking you for invasion by a certain covenant in a specific area of the game. When there are no players to invade, the effect of your misdeeds can end up diminished. KillerKram concurs. “A few of my friends picked up Dark Souls in a sale and I told them about this event. They are currently trying to get through it with me as a guide. Having invasions and such is cool for reminding them that Dark Souls is a dangerous and unforgiving place. Several players reported that some griefers took the brutality to an unfair level, standing in front of doorways to block their host’s progress, or using unbalanced strategies or builds designed to punish new players, or even just cheating outright. For many, though, Return to Lordran is a way to grant new players the same Dark Souls experience that these veterans so enjoyed over half a decade ago, and for most, that’s enough for them.